The Megalodon (meg-ah-low-don) is one of the creatures in ARK: Survival Evolved. It is a large, prehistoric shark. Were it not restricted to the waters, Carcharodon ultramegalodon would be one of the most dangerous creatures on the island. As powerful and dangerous as the Tyrannosaurus is on land, Megalodon is near its equal in the water. In addition, it has a speed advantage over any non-aquatic creature when submerged. Megalodons need large quantities of food to sustain themselves, so they attack most creatures immediately on sight. Smaller fish are the sole exception I've seen; I believe this is because they cost more energy for Megalodons to catch than the predator would gain. Having access to the resources and treasures hidden deep within the ocean is near impossible without a domesticated sea creature. The Megalodon, though difficult to domesticate, proves to be very useful when exploring the deep sea. It's not the most efficient swimmer but it should be able to protect your cargo should you find yourself in a hostile encounter. After visiting Sir Edmund Rockwell, Helena went to The Island's ocean to study marine life with the help of the Painted Shark tribe, she wanted to find a pattern between the mainland and ocean ecosystems to understand the scientific abnormalities on this island. One of the creatures she studied was megalodon, this creature is extremely different from what she knows about sharks back home. Their aggressiveness stood in contrast to most sharks, which are territorial, and their gestation period only lasts for one week. Their intelligence was also confusing. Sharks are neither mammalian nor avian; they're fish that rely on instinct, but what she saw didn't make sense - megalodon can be easily trained by survivors to make them obedient and can be ridden. Megalodons will stay in the deeper waters unless attacking prey, but even then they rarely enter shallow areas. They are aggressive and can swim faster than most creatures, including the player. They also aggro on a player from a very long distance, therefore it is not uncommon that the player suddenly has to deal with multiple Megalodons at once. Resembling nothing less than an oversized great white shark, Megalodon is the most common of the large, dangerous predators in the oceans of ARK. The ones in ARK appear to be based on the minimum estimates for the monster shark's size. This section displays the Megalodon's natural colors and regions. For demonstration, the regions below are colored red over an albino Megalodon. The colored squares shown underneath each region's description are the colors that the Megalodon will randomly spawn with to provide an overall range of its natural color scheme. Hover your cursor over a color to display its name and ID. For example, "cheat SetTargetDinoColor 0 6" would color the Megalodon's "body" magenta. For taming, the best method is to tranquilize one or a few Megalodons which are enticed into shallow waters by swimming. 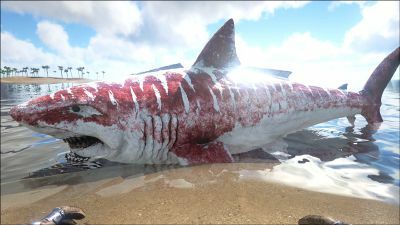 Since the bow cannot be fired underwater, but can be fired into water for at least a short distance, an effective way to tame Megalodons is to tranquilize them in shallow waters with 10-30 Tranq arrows. One method of doing this is to build an elevated platform from which to fire arrows into the water. Keep in mind, this method will draw numerous Megalodons, which will occasionally swarm and target your tamed Megalodon, so bring plenty of arrows and be prepared to defend your new companion. Find a Megalodon in somewhat shallow waters, and then have another player aggro the Megalodon by stepping in and out of the water in their aggro range. While the other player does this, shoot it with Tranquilizer Arrows. Repeat until it is knocked unconscious. The rocks that are just under the water in the sea are a good taming spot for this. Stand on a shallow spot and the sharks will stick their heads out to attack you, allowing you to easily shoot them with a bow. You can also tame one or several ichthyosaurus (which requires only meat) and swim them up into a river too shallow for the megalodon. The megalodons will group at the head of the river, usually partway out of the water. A crossbow is useful in taming the Megalodon as it can be fired underwater, unlike the bow. As you can fire a crossbow from the back of an Ichthyosaurus, a bit of fancy riding can let you run circles around the Megalodon while shooting it. This also allows you to 'herd' it to where you want it to be knocked out, as it will start swimming away from you as its torpor nears max. Using the Scorpion is another good tactic to knock out the Megalodon, since the scorpion can swim. Ride it and sting the shark, then back up out of range. Repeat this every ten seconds until the shark falls asleep. This section describes how to fight against the Megalodon. It is not recommended to full on engage a Megalodon in the water, but rather attack it from an advantageous position such as a raft, rock, the shore, or perhaps even a platform above or partially in the water. Make sure you see it coming! Escape if you cannot fight, or instigate the battle if ready. If you plan to engage a Megalodon via the shoreline, make sure you have either a Sword, Pike, or an adequate supply of Spears. Megalodons appear to lose interest in the player when the player is swimming in shallow water around the beaches. 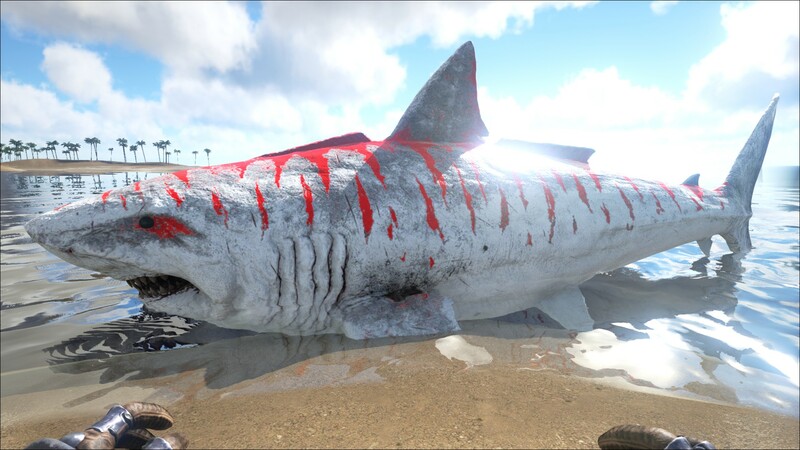 Thus, a very easy way to deal with even large groups of Megalodons is to lure them into the water around the beaches and repeatedly stab them until they die, as they will not attack the player. Just make sure that you keep an eye on your Stamina! Ranged weapons such as the bow or Longneck Rifle can't be fired while swimming. Only the crossbow or harpoon gun can be used underwater, otherwise the player is left to a frantic stabbing battle with a pike or sword so make sure you bring a crossbow or harpoon gun if you plan to go underwater. Use a Longneck rifle or bow if you plan to fire at it from land, which is the safer option. Alternatively, if the player wishes to deal with Megalodons via the beaches, melee weapons such as Spears or a Pike are essential. The Megalodon has incredible range in terms of becoming aggressive (aggro range), so they will appear out of nowhere to chew upon the oblivious player when they enter the water. Do not become distracted when underwater, as such choices lead to death at the hands of an otherwise preventable killer. Megalodon can't go out of the water, so you could shoot it from above ground or from your raft. Trilobite Farmer: The Megalodon is able to easily kill trilobites and farm them for their chitin, oil and silica pearls. Megalodons spawn in all waters of the outer sea. They do not spawn in rivers, but can be brought there while chasing prey (be it a player, tamed or wild creature). 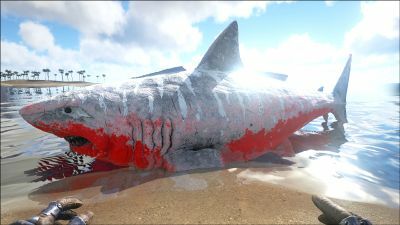 One unusual location where Megalodons can be found are waters around the red Obelisk, mostly because of two wide connections with the sea. Actually, the Carcharodon ultramegalodon in the game is not a real Megalodon (Carcharocles megalodon), but an oversized Tiger shark. Both of them belong to Carcharodon, but not Carcharocles. Strangely, the dossier for this creature states; "Were it not restricted to the waters, Carcharodon ultramegalodon might be the most dangerous creature on the island." This is likely an exaggeration, as it has only half the health of a Rex. It also has less health and damage than Spinosaur. The most capable waterborne predator is Mosasaurus. Megalodons do not fit through the normal Dinosaur Gateway. An Ichthy can easily outrun a Megalodon. Megalodon cannot be tracked by Transponder Nodes. People say ARK's Megalodon is too small, but they actually did get the size right. It is just that when the player is in first person view, the sharks look smaller. Before v183.2, tamed Megalodons could be beached and killed if the player riding them was not careful. Before v175.0, wild Megalodons could beach themselves and die. This page was last edited on 14 April 2019, at 16:36.